Ok, so most of our efforts were theoretical until yesterday, but when you can print temporary passes at home and pull together a dessert that screams Papa with store cupboard staples, more time doesn’t necessarily mean better results. The National Trust membership was hugely well received. It allows him, Nanny and all 3 dotes free entry into 17 sites around N.I (parking included) and it was presented in the biggest card known to man (^-^) Nanny enjoys these joint presents immensely. 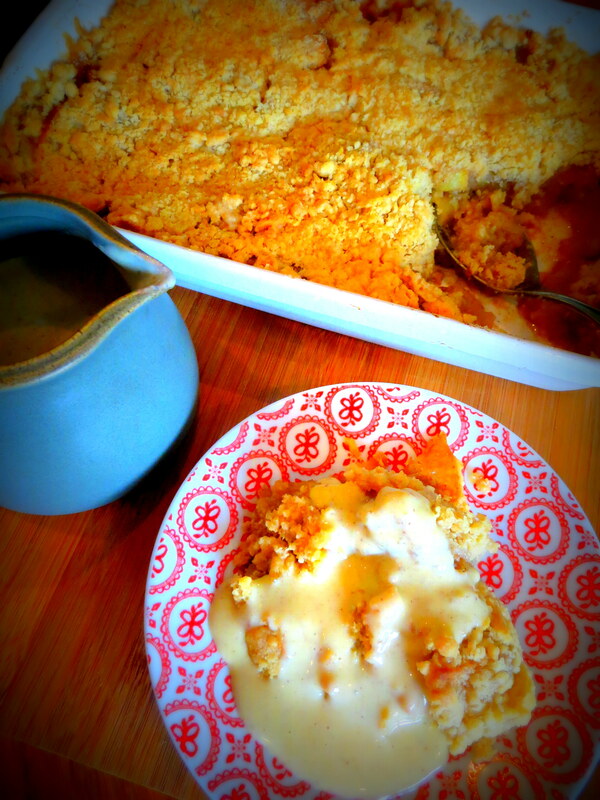 A Bramley apple crumble may not be the most summery of desserts, but neither is our weather. And a recent dinner out had both Papa and me in raptures over cinnamon custard. Lets just say Nanny and Eims had serious food envy. A little flick through my go-to recipe book Perfect by Felicity Cloake and the work of deciding on the perfect custard recipe is taken away for me. A bit of chopping, a bit of crumbling and a ton of cinnamon later. Voilà. Happy Father’s Day.